Are there any dangerous trees or branches in your compound? If so, then you should consider Tree Trimming in Los Angeles regularly. At Your Way Tree Service Inc; we are ready to offer quality Tree Removal in Los Angeles. With us you can be sure that all the work you need done will be carried out by trained experts who have well equipped knowledge on what is best for your tree and to make best use of their health and attractiveness. You should always be keen to observe your tree on a regular basis. Once in every 6 months you should have a professional to carry out an inspection on your trees so as to determine the safety and health of your garden. Every tree should be regularly pruned, trimmed and inspected for other damages .It is necessary that you give much attention to the trees in your garden since they can cause severe damages which can result to lose of property and also lose of lives. Trees provide beauty and shade around your compound .They provides fresh air as well as a calm place to rest. But there comes a time when one of those trees might fall and can cause property damage. That is why it is wise to be able to identify visible signs that a tree may become a hazard before it happens. 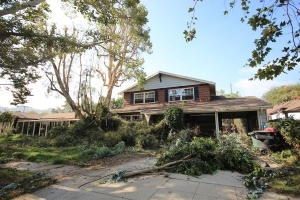 These are some signs that you should be attentive to look at in your trees: Trees that leans too much over the house or garden, trees with broken branches, dying or dead parts of the tree, open crack in branches or in the trunk, presence of decays and rots of the tree, split trunk and root injury. Therefore evaluating and treating hazard trees is an activity that should be done regularly, it requires serious knowledge and a lot of expertise in order to perform it correctly. At Your Way Tree Service Inc we guarantee our clients that we will ensure to properly understand your needs, in case of any mistakes that may happen while we work for you, we admit it and fix it immediately, we have highly trained employees with the tree service experience, we give primary attention to the safety of your property, we use well equipped equipment which are sterilized before and after every job to avoid spread of infections from one tree to another. We also guarantee that our work is covered by full range liability insurance for up to $2,000,000 and a $1,000,000 on Workers Compensation Insurance. In case you may need prove of it, we can produce all the insurance certificates and coverage we have taken .With over 10 year experience in tree services we can assure you of the best job done so as to prove that you have the best value for your money as well as for the safety and beauty of your trees. Do not hesitate to contact us via our email address or visit our company site so we can help with Tree Removal in Los Angeles.